Language is alive and forever changing. Approximately 25,000 new words are introduced into English on an annual basis. Which of these do you think will survive into the next century? 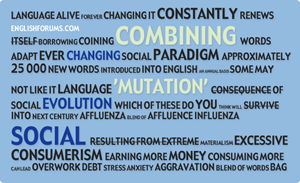 Affluenza - A blend of 'affluence' and 'influenza'. A social disease resulting from extreme materialism and excessive consumerism. Earning more money and consuming more can lead to overwork, debt, stress and anxiety. Baggravation - Blend of the words 'bag' and 'aggravation'. A feeling of annoyance and frustration at the airport when your baggage has not arrived but other passengers' bags have. Blamestorming - A method of collectively finding one to blame for a mistake no one is willing to confess to. Often in the form of a meeting, assembly for the sole purpose of deciding who is to blame for a 'screw up'. Copyleft - The opposite of copyright; whereas copyright imposes restrictions on the distribution of a work or publication, copyleft eliminates restrictions and allows freedom of use for all. Edutainment - A form of entertainment that aims to educate and entertain. E-Quaintance - A person only 'known' through online networking. Frankenfood - Derogatory - a food that contains genetically modified ingredients. Freemale - A woman who is happy to stay single and independent, ordinarily to avoid the traditionally perceived constrains of a relationship. Geezer - Sometimes used by young people to mean, not just a man, but someone who is admired for breaking the rules or having his or her own unorthodox style of behaviour. Guesstimate - Blend of 'guess' and 'estimate'; a rough estimate without any claim of accuracy. Infomania - Constantly checking and responding to email and text messages. Infotainment - Blend of 'information' and 'entertainment'. Online services connected to information and leisure activities. Jumbrella - Blend of 'jumbo' and 'umbrella'. Very large umbrella set above tables outdoors at a coffee shop, pub or restaurant. Mocktail - Non-alcoholic drink that looks like a cocktail. Netiquette - Blend of 'network' and 'etiquette'. A set of rules governing commonly accepted appropriate behaviour or courtesy while on the internet. The absence of physical presence resulted in a distinct idea of 'appropriate behaviour' among 'netizens'. Netizen - A blend of 'internet' and 'citizen'; a person who spends an excessive amount of time on the internet. Nonversation - A conversation that seems meaningless or ridiculous. Outernet - Traditional media (newpapers, magazines, radio, television) as opposed to the internet. Screenager - A young person or teenager who spends a lot of time in front of the computer screen. Staycation - A vacation in which you stay at home and relax, perhaps visiting places close to where you live. Threequel - The third film, book, event, etc. in a series; a second sequel. Weblish - A form of English that is used on the web (use of abbreviations, acronyms, small letters, absence of punctuation and hyphens etc.) Also known as: webspeak, netspeak, internetese.